Raghavan (center) organized Thai farmers Samrat Thong-Iam’s (left) and Man Samsee’s (right) visit to Bates during their national tour. Photograph by Rene Minnis. Bates College senior Mallika Raghavan has earned distinction as a semifinalist for The Coach Wooden Citizenship Cup, a national award recognizing the most outstanding role models among athletes. Raghavan (Chappaqua, N.Y.) is one of 14 semifinalists for the Wooden Cup, and the only tennis player or Division III athlete on that list. There are five others who have earned finalist honors, one of whom will be announced on Jan. 24 as the Wooden Cup’s college recipient. A politics major at Bates, Raghavan has already acquired considerable experience doing volunteer work in the area of health, poverty, and development issues. As detailed by Arlene MacLeod, Associate Professor and Chair of the Politics Department at Bates, while studying in Thailand, Raghavan “worked with Thai organic jasmine rice farmers from Surin and helped them take their organic rice sales to a global market. This project helped rice farmers, but also educated students in the U.S. about fair trade. Mallika worked with a small group of students and an non-governmental organization (NGO) to bring two farmers from Surin to the Northeast and California to speak about Thailand and fair trade. She has also worked with the dining services at Bates to institute Fair Trade Rice on a regular basis. Raghavan has earned a reputation as a hard worker and gritty competitor. Also while in Thailand, MacLeod writes, Raghavan “worked with a number of HIV/AIDS communities and the Mahasarakham Hospital to understand how rural areas were affected. She conducted interviews as well as wrote an article in the NGO ENGAGE’s annual publication. She worked to connect these HIV communities with advocates in Northeast Thailand, whom she had met through her study abroad program. “Mallika is a considerate, thoughtful and very hard-working person, and I think she’s a great example of what Bates students stand for and can achieve,” wrote MacLeod. For additional information on community outreach and volunteer opportunities, visit the Harward Center website. WILLIAMSTOWN, Mass. — Bates College junior Ben Stein was a semifinalist in singles and a finalist in doubles with sophomore teammate Amrit Rupasinghe to highlight the Bobcats men’s tennis team’s weekend at the ITA Division III Men’s Regional Championships, hosted by Williams College. Seeded fourth in the 56-player field, Stein (Pelham, N.Y.) reached the semifinals by beating Steven Nieman of Brandeis 6-4, 6-4, Mike Mintz of Amherst, 6-2, 6-0 in a round of 16 match, and beating the fifth-seeded Andrew Thomson of Middlebury, 6-2, 1-6, 6-2 in the quarterfinals. Trinity’s Spencer Feldman ended Stein’s run in a semifinal battle, 2-6, 6-4, 7-5. Meanwhile, Stein and Rupasinghe (Colombo, Sri Lanka) advanced four rounds in the doubles bracket to meet Middlebury’s Marinkovic/Thomson duo in the championship round, where they dropped a narrow 8-6 decision. The unseeded Bobcat pair defeated, in order, Neely/Fried of Bowdoin (8-5), Furnaga/Devlin of Williams (9-7), Wan/Schwartz of Amherst (by withdrawal) and Gates/Sullivan of Bowdoin (8-6) in the semifinals. On the other side of the doubles bracket, Bates sophomores Maxwell Berger (Concord, N.H.) and Ryan Mannelly (New Canaan, Conn.) teamed up to defeat Braude/Whitter of UMass-Boston 8-3 before bowing out to top-seeded Lerner/Avrahami of Amherst 8-4. Bates sophomore Michael Reiss (Rockville Centre, N.Y.) advanced two rounds in the singles bracket, downing Eliot Jia of Middlebury (7-5, 6-2) and Nick Lebedoff of Williams (2-1 ret.) before Feldman ended his run as well. Rupasinghe and Berger also won their opening-round singles matches. COLOMBO, Sri Lanka — Bates College’s Amrit Rupasinghe ’10 captured the national men’s singles title in his native Sri Lanka on August 19, defeating four-time runner-up Rajeev Rajapakse in straight sets, 7-5, 7-6, 6-0, in Sri Lanka’s 92nd annual national tennis tournament. 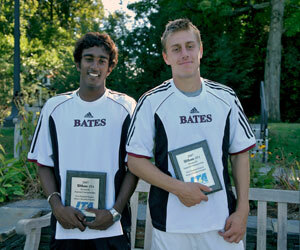 Rupasinghe, 20, is entering his second year at Bates, where he played both first and second singles for the Bobcats as a first-year. 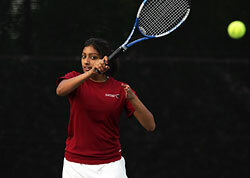 The righthanded Bobcat also pulled off a “major upset,” reported the Daily News of Sri Lanka, in the semifinals of the tournament by defeating fourth-seeded Dinusha Wijesuriya, losing the first set 6-3 but coming back with consecutive 6-2 set victories. He defeated yet another seeded oponent, Zaw Zaw Latt, in yet another grueling match en route to the semifinals, 6-3, 2-6, 7-6. 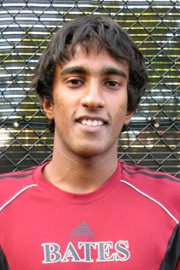 Rupasinghe has competed in four Davis Cup matches for the Sri Lankan team, winning once. He also captured the national under-18 title in 2005. HADLEY, Mass. — Bates College sophomore Benjamin Stein was named to the All-NESCAC Men’s Tennis Second Team in singles, the conference announced on Thursday. Stein (Pelham, N.Y.) had an immense season for the Bobcats (6-7), and has shown marked progress throughout his collegiate career. He moved from playing No. 5 singles and No. 3 doubles as a first-year student to playing either No. 1 or No. 2 singles, plus No. 1 doubles, all year. 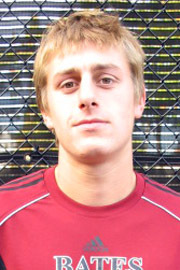 At singles, Stein amassed a dual-match record of 11-2. 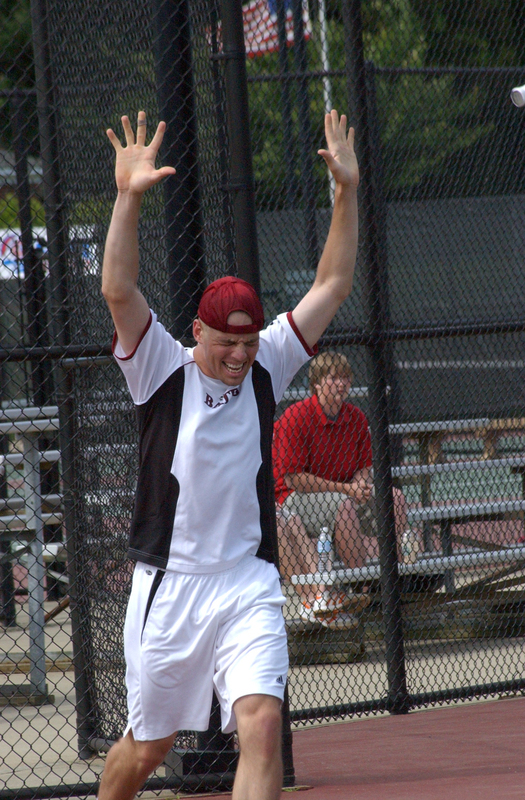 FREDERICKSBURG, Va. — Bates College senior Will Boe-Wiegaard defeated Middlebury College senior Brian Waldron in straight sets on Monday morning, 6-4, 6-3, to capture the singles championship in the 2006 NCAA Division III Men’s Tennis Championships. Boe-Wiegaard ends his senior season with a 26-6 record in singles play. He was unseeded in the 32-player Singles Championship when it began, but en route to the championship he defeated the No. 1, No. 2 and No. 8 seeds — Matt Seeberger of UC-Santa Cruz, Waldron and MIT senior Evan Tindell, respectively — all of whom had beaten Boe-Wiegaard in their previous meetings, as had Middlebury senior Nate Edmunds, whom Boe-Wiegaard ousted in the semifinals. To win the title, Boe-Wiegaard played five singles matches in a period of less than three days, along with two doubles matches with senior teammate Tristan Beach (Grand Rapids, Mich.). Boe-Wiegaard and Beach made it to the quarterfinals of the Doubles Championship. Boe-Wiegaard first defeated Yoji Masuoka of Emory University, who had helped win the team championship for Emory the day before, 6-3, 6-3. “I made an adjustment and started feeling really good,” said Boe-Wiegaard of the match. Next up on Saturday was Seeberger, the two-time defending national champion, who had beaten Boe-Wiegaard in the national final the year before. This time, Boe-Wiegaard dropped the first set before reclaiming his groove in a 3-6, 6-2, 6-2 victory. “That whole day just flew by,” he said. “I was just really zoned in.” That feeling continued on Sunday, though Boe-Wiegaard admits he was nervous about facing MIT’s Tindell, who had beaten him 6-3, 6-2 during the regular season. “I had lost to him pretty convincingly, and I know he had a boatload of confidence about facing me,” he said. Boe-Wiegaard cruised in the first set, 6-1, but fell behind in the second set 3-0. He then broke serve twice, regaining confidence en route to losing the second set 6-4, which he carried into a 6-3 win in the third set. Boe-Wiegaard went on to play Middlebury’s Edmunds in the semifinals. The Middlebury senior had beaten Boe-Wiegaard in the ITA tournament semifinals in the fall. “He’s a really consistent player, so he’s very dangerous,” said Boe-Wiegaard. “He’s not going to make mistakes, so you can’t, either. But I felt so good, and I didn’t feel at any point that I would lose.” Boe-Wiegaard cruised into the finals with a 6-3, 6-2 victory over Edmunds. 2006 National singles champion and former Bobcat Will Boe-Wiegaard featured!